Last week we focused on history and professional political athletes. Our contribution today comes from South Florida where Marcos Restrepo brings us to the world of youth sports in our fourth installment of Politics on the Field. With the Super Bowl past us and all the attention the world plays to sports industries and media, it’s important to remember that where sports grows from in the innumerable fields and arenas where children learn and play. Restrepo presents a picture of these games a father and someone critical of what capitalism has done to a game that continues to capture the passion and imagination of millions. “Futbol is a simple game” he says. “You keep the ball down, on the ground, and pass it forward, la tocás and like Brasil, like Pele, you look to score”. These were the exact words from this Argentine from Mendoza province. I know of the grapes and the wine born in his region of Argentina but he has the advantage: his wife is from Bogota, where I was born. He praised South American futbol, the rough and tumble style so different from the European style where certain players are untouchable. This Argentine who we will call Mauro loves futbol. I know this cause he’s a coach, in the Under 9 category in Hollywood, Florida. His praise for Pele and Brasil are quite an example of admiration and solidarity because as we all know Argentina y Brasil en futbol, well let’s just say there is no love lost. “El Futbol no es complicado,” he adds in his Southern accent that any Spanish speaking person knows comes from Argentina, as we watch a group of 12 year old kids run the same drill time and again under the guise of a coach from Croatia. “You think we’ll ever see the 4-3-3 again, I ask”. (4 players defending; 3 in the mid field; and 3 up top hunting for a goal). “I’m trying to bring it back,” he responds. Futbol has gone down a steady road of complex tactics a la Pep Guardiola, Jose Mourinho, Marcelo Bielsa, Sir Alex Fergusson and so many other tacticians that most of humanity/fans will only see on a screen. It wasn’t always like this. 100 years ago Football Soccer was a simple game; it offered a rowdy afternoon, with 2 defensive players, 3 in the mid field, and 5 up top looking to score. Those were times in which players and coaches were local heroes; a time when Jimmy Hogan, one of the greatest coaches of English football, scoured the continent like many other travelers. That went out the window quite a while ago, and despite corporate sponsors and FIFA corruption futbol is still a game. All you really need to do is spend a Saturday afternoon in any barrio of El Alto in La Paz Bolivia, Ciudad Bolivar in Bogotá, or any large city de Nuestra America. You could also visit South Florida where you can savor the speed, the wit and “keeping the ball on the ground” style on dirt, grass, or turf, where men, women and children of different ages show up to play futbol, that tagged along with the hundreds of thousands of Caribbean, Spanish-speaking and Brazilian immigrants. In futbol, like in so many things human there is the desire to compete and cooperate. Players practice to get the tactics right, to dominate and control the passing game, they need each other and yet those same players on the same team compete for a position. Then there is game day. Uniforms are cleaned and pressed. Family and friends, the fans show up, and fill the sidelines to cheer on the team. The fans, the supporters, they are player number 12. Each team will field 11 players; player number 12 is the crowd of faces, cheers, chants, laughter, curses who believe or hope today is a good day, justice will prevail and the good guys, my team, will win. Fans are not there to cooperate with the other team, they growl at every call the referee makes against their beloved 11. Today as never before futbol rides that fine line of cooperation and competition that we try to balance out in our own lives. 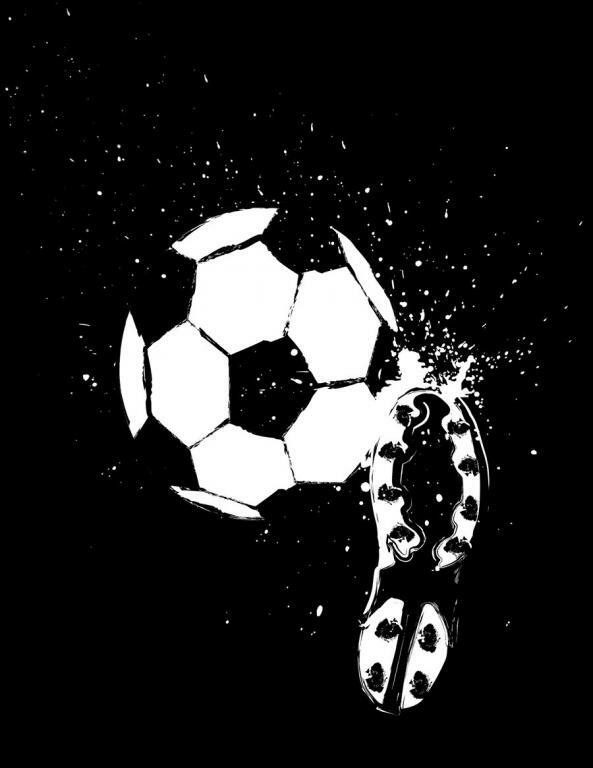 Futbol also performs a dance onthat line between the game and the corporate spectacle. Futbol has been called the beautiful game, but in the current weekly spectacle teams need to get results, too much beauty is flawed, not practical, if you can’t bankroll the wizards of the game. Sport agents and investors, Adidas, Nike, EA Sports, to name just the most visible corporations have taught fans all over the world to focus on two or three players, two or three teams. In futbol like in so many other human activities we focus on that which corporate media sells. Futbol also struggles as it has for decades between the pleasures of the game well played and results. The pleasure of leisure, that bright human endeavor that intertwines joy and passion, that provides some time off from the rat race of production blossoms on a futbol field when just the fun of the game is enough, when beautiful and creative passing brings joy to the passionate who show their approval with cheers and applauses. We can all chill when pleasure is the winner of any afternoon. Corporate sponsors, on the other hand turn shirts into love, and mere spectators into fans. There is no denying the multi-billion dollar business that is the spectacle of futbol, overwhelming us with competition, ravenous rage to win, and win more, and win it all. National and team flags waving high. Spectators are proud to show off and cheer even the most boring result driven futbol, a style that some commentators have deemed anti-futbol. The professional spectacle of futbol has inverted the pyramid. We went from five attackers, to one sometimes two. Pele scored over 1,200 goals. That is not even a dream in today’s hyper-professional spectacle. But still fans push forward and come out to support our side, a history of heroes and goats, legends forged in our neighborhood, our school and we argue, and strategize and look to better days. Without a doubt the social and political violence that engulfs some countries makes itself present in the ‘barras’ of fans who show their support with violence. In that same measure unbridled social consumerism of phones, computers, sneakers and a thousand other products also has its place in futbol stadiums across the developed world and on the backs of those fans from developing nations who have the extra income to buy their teams jersey. Yet maybe like in so many other endeavors futbol offers the pleasure of getting out there and dancing that fine line of cooperation and competition, not as a spectator of some idols life, but as a fan/player. The fan cannot get lost in the spectator. A fan may not have the money to go to the stadium and watch the professional teams. Tickets are expensive, but many fans can afford second division soccer, semi-professional players, like the Fort Lauderdale Strikers. But what is most important is that fans CAN PLAY THE GAME! Spectators may have already lost sight of this. We should be fans of the game, if a part of that love goes through a professional team, that’s fine but it is not the end all. Well except for corporate sponsors of course. A coach is a mentor, someone who like Mauro, shares discipline, shows a child he or she can reach deeper and still have fun, enjoy the effort and grow as a human being while cooperating and not just competing. The possibility of pleasure is always open to those who step out onto the field on any given day. Even though the lust of competition lurks in the shadows. Very few futbol players of the many millions who play the game on streets, raw dirt, grass or turf around the world will ever grasp the glory and the pain that comes with that final moment of loss or triumph. Despite the corporate spectacle, or maybe in spite of it people still go out under rain or shine to play the game, 11 players, some beloved fans and la numero cinco. Marcos Restrepo currently works as a health educator in Fort Lauderdale, Florida and lives in Hollywood, Florida. He has worked as a news reporter, an English and Spanish teacher and is a life long reader of novels (especially crime novels), and short stories.